Three local beverage brands have partnered together to bring our fans a unique cocktail experience. Liquor Express in Tempe participated in Knob Creek’s Single Barrel Select program. This opportunity allowed Liquor Express to select a one-of-a-kind barrel that reflects the way Booker of Knob Creek thought whiskey should be- an individual adventure. We partnered with AZ Bitters Lab to create two cocktail recipes that you can make featuring this spirit. 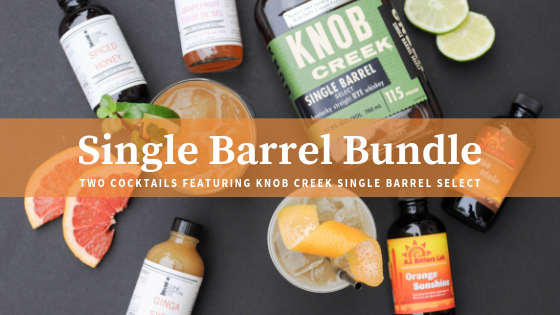 Head to Liquor Express to purchase the Single Barrel Bundle so you can recreate these cocktails at home. Our friends at Standard Wax are releasing a new scent! Grapefruit Mint reminds us so much of our Spring Seasonal, Grapefruit Fleur de Sel, we just had to make a cocktail inspired by it before our season is over. A Cocktail for Cinco de Mayo! Do you know why we drink on May 5th? Here's a cocktail recipe inspired by the historical Battle de Puebla that you can make to celebrate Cinco de Mayo! It's time for Grapefruit Season! Our returning seasonal, Grapefruit Fleur de Sel, is made in tribute to citrus season. We whipped up a couple cocktails that we love sipping on during this time of year. Check out this blog post for some recipes!